The sign (see above) was designed for the waters of Downeast, Maine, and the Penobscot River watershed. A Kennebec-specific sign was considered but dropped due to existing signs sponsored by other organizations. These signs are especially important now that Atlantic salmon have access to sections of rivers, especially the Penobscot watershed, and streams they have not had access to for decades due to dam removal. At this point in Atlantic salmon restoration every fish counts, especially breeding age adults, and we need to do everything possible to protect them. Atlantic salmon parr may be encountered in many streams as well due to ongoing restoration stocking efforts. These are the fish we need to return to the ocean as smolts, and then find their way back to their natal streams as sexually mature adults. We have ordered 100 signs, the first 25 of which have been received, to cover Downeast Maine and the Penobscot equally. Native Fish Coalition has raising the money to purchase the signs and will help DSF and ASF get the signs put up. 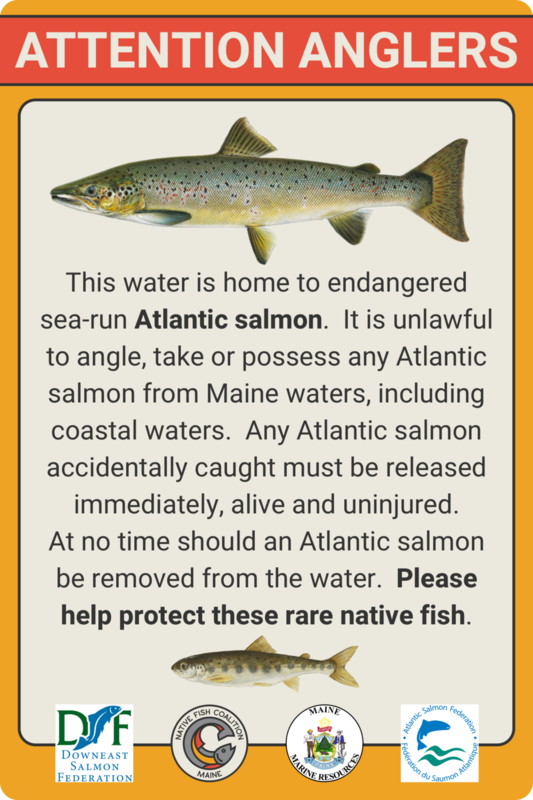 If you would like to help NFC, DSF and ASF offset the money used to procure these signs, and help protect Maine's endangered Atlantic salmon, please click here to make a donation. Every dollar helps and your support is greatly appreciated. This project is dedicated to the late Clinton “Bill” Townsend of Canaan, Maine, Maine's foremost “fish conservationist.” Few if any have done more for Maine's Atlantic salmon as Bill. An avid angler, Bill was the rare breed of sportsman who continued to lobby for the protection of a fish he could no longer angle for. Few stood taller and for longer than Bill in regard to the plight of Maine's Atlantic salmon. Bill Townsend and NFC founding member, National Vice Chair and Maine board member Bob Mallard on the Kennebec River in Maine.